A Road Show is the presentation of shares by an issuer so that potential buyers get enthusiastic to acquire them. Roadshows refer to when the management of a company runs an issuance of securities or a public offering (IPO) travels a continent, region or country to offer presentations to actors, analysts, managers of funds and potential investors. A road show is intended to generate enthusiasm and interest in the subject and is often essential for the success of the offer. A road show is not to discuss with current or potential investors because in that case no sale is done. We, the people of Geocensos, want to do something similar. To depart with our baggage full of experiences and knowledge to offer to the public our activities, showing current and potential stakeholders the value of what we do, which focuses on censing topics ok geo-information. 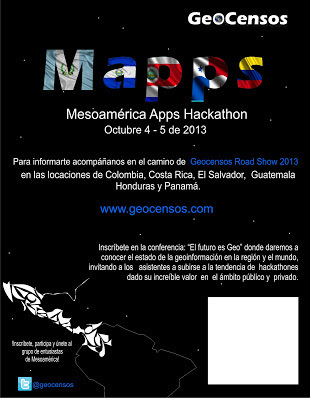 We have the pleasure to present to interested public our project GeoCensos RoadShow 2013 run by GeoCensos Foundation for Central America, Colombia, Mexico and Venezuela. GeoCensos RoadShow 2013 is a series of events that will bring together developers, executives, local in region partners and members of GeoCensos team in major cities from different countries of Mesoamerica, ranging from Colombia to Guatemala, to discuss how geo-information advances are transforming the habits of citizens and consumers, as well as services offered by private and public organizations. A simultaneous objective of this Road Show is to invite stakeholders to organize together a hackathon next October 4 and 5 for the Environment in Colombia, Central America and Mexico, initiative for which we are looking for local leaders. In the events organized in each city that we visit we will consider the question of why a wide range of applications based on geo information is emerging everywhere. We can see that Geo information is affecting daily life, business and even public services through innovative applications, software, hardware and development of augmented reality that are transforming once again the scene of the information and communication society. We believe that this is in part explained by the growing importance of hackathons or programming marathons. A lecture will approach the State of the art of the discipline in the region and the world, inviting attendees to get on board of the trend of hackathons in our Mapps Hackathon given the incredible value of these experiences in the public and private environment. • How did the growth in the use of the "neogeography" and open source geospatial solutions democratized information. • How does the increase in the use of geospatial data "multimedia" - such as Google Street View, Microsoft Photosynth and photo and geo-referenced videos will affect the privacy of individuals. 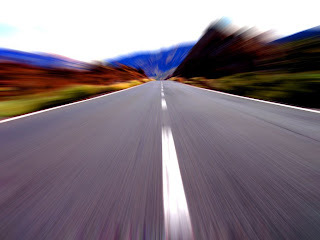 • How does the increased generalization of the tracking of location or location tracking can save lives of people. • What is crowdsourcing and citizen science, disciplines that enhance community actions to manage and participate in the territory? • How are the devices of augmented reality that are used to access a wealth of information on the daily walk. • How the provision of alerts or notices works to accompany a route or section of a pedestrian. We invite interested actors in general, developers and organizations to run together a hackathon taking advantage of these trends and to develop in the month of October, whose theme will be focused on the environment and will take place in Colombia, Central America, Mexico and Venezuela. We are considering issues such as climate change, natural disasters, smart cities, coastal tourism and humanitarian assistance. Lessons will also be offered and contents of how to organize a hackathon.